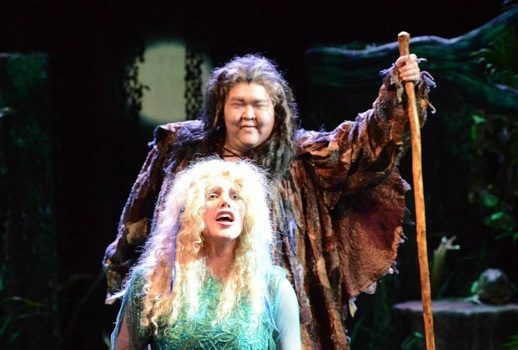 Let’s start with the positives—especially, two really terrific assumptions: Alice Chung as Jezibaba and John Matthew Myers as the Prince. Still in her first year at AVA, Chung has already been noteworthy as the Zia Principessa in Suor Angelica; here, she made an even stronger impression. Myers possesses a plangent, substantial tenor, appealingly vibrant and with a sense of considerable power in reserve, and an ardent stage presence. Expect Walther von Stolzings, Siegmunds, and similar heroic roles in his future. In featured parts, Timothy Murray, heard from offstage in the Hunter’s calls, commanded attention with a beautifully placed and modulated baritone. Mezzo Pascale Spinney has done good service at AVA in a number of small roles; seen here in the larger part of Turnspit, her tangy mezzo and lively stage presence were very winning. Aubrey Ballarò, Rebecca Gulinello, and Gabriela Flores were a vocally effulgent trio of Water Sprites. In the title role, Kara Mulder showed a considerable lyric instrument with a warmly colored mid-range, musical phrasing, and an engaging stage presence. But there was little spin in her upper register, and particularly in the final scene, she often sounded at the limit of her resources. Even with a single piano accompanying, Rusalka seems a premature assumption (she’s also an AVA first-year). Speaking of that piano (certainly well-played here by music director Luke Housner), we come now to the less successful aspects of the evening. More even than in Das Rheingold—which AVA has done successfully in the past—Rusalka is ill-served by the reduction. The mix of folk elements and late-Romantic density really needs Dvorak’s gorgeous orchestral palette. But a much bigger problem was K. James McDowell’s production. A stage stuffed with plants to the breaking point (literally: at the opening, there was at least one falling branch) allowed for little freedom of movement—leaving the singers to strike poses. Costuming was notably unflattering, and scene shifts took far too long. Much of this Rusalka evoked the kind of kitsch stagings that once upon a time defined opera (and which are sent up so memorably in I Love Lucy’s wonderful mock-operetta, The Pleasant Peasant). Admittedly, Rusalka’s mix of fairytale and psychological character study is notoriously hard to bring off (the Met’s Chitty Chitty Bang Bang-esque mounting by Mary Zimmerman is an especially egregious example). Here, less would be far more—I wish McDowell and company had gone for something vague and symbolist. That would have allowed more focus on the singers—where AVA, as usual, has the most to offer.